Cast: Brad Pitt, Casey Affleck, Sam Rockwell, Mary-Louise Parker, Sam Shepard, Garret Dillahunt, Paul Schneider. Written and directed by Andrew Dominik, adapted from the novel by Ron Hansen. Story: The assassination of Jesse James. Er, by Robert Ford. The clue's in the title. Running Time: 2hrs 40 minutes. I can't say I'm a fan of westerns. All that shootin' folk for lookin' at each other wrong - it just seems a tad ... insecure. So I was quite taken aback to find The Assassination of Jesse James by the Coward Robert Ford was right up my alley. It helps having Brad Pitt in the lead role. Along with Johnny Depp, he's the most reliable performer of his generation, continually bringing new style and charisma to each and every role. It's stunning that he's only once been nominated for as Oscar (for 12 Monkeys), and here as the eponymous Jesse James he delivers another unrecognised but scintillating performance. 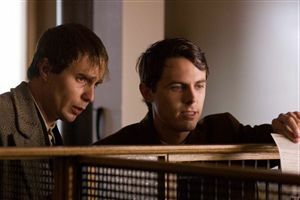 Unbelievably, especially considering his dramatically-challenged brother Ben, Casey Affleck is even better as Robert Ford, the wet-behind-the-ears wannabe gangster with an obsession for his hero Jesse. In fact, if it weren't for Javier Bardem's menacing terminator in No Country for Old Men, I'd say Affleck was a sure thing for the Best Supporting Actor. He still has an outside chance and in my opinion he deserves it. Amidst these two stellar performances, no-one else stands a chance. In particular, Sam Rockwell (Zaphod Beeblebrox in Hitchhiker's Guide) appears way out of his depth and Zooey Deschanel (Trillian in the same movie) can't do much with the ten minutes she's given at the end (despite getting a full credit, oddly). Fortunately that's not important, as the direction, by novice Andrew Dominik, is magnificent. The pace is VERY slow and the length enormous (2 hours 40!) but when the show is crafted this well, that's OK with me. The suspense builds palpably towards the inevitable bumping off moment and, even though we already know the outcome, it's still shocking when it happens. I'd never heard of this director before, but if this is anything to go on, we have a new name on the scene. 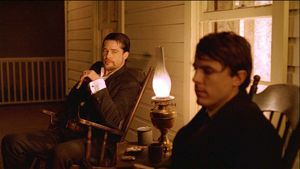 The Assassination of Jesse James by the Coward Robert Ford is a very slow movie and thus will probably not appeal to those who usually like westerns. Drink it all in, though, and you have a masterpiece on your hands. The surprise gem of the year. I think the average moviegoer will enjoy it: 4/5 - purely because the ponderous pace will put many off. Testosterone Satisfaction Rating: 1/5 - many guns, though this isn't Rambo. Every gunshot is carefully considered. Zooey does a fan dance but it stops before the good bit. To enjoy this film you should: not expect a traditional western. The Assassination of Jesse James by the Coward Robert Ford was released in the UK on 30th November 2007.